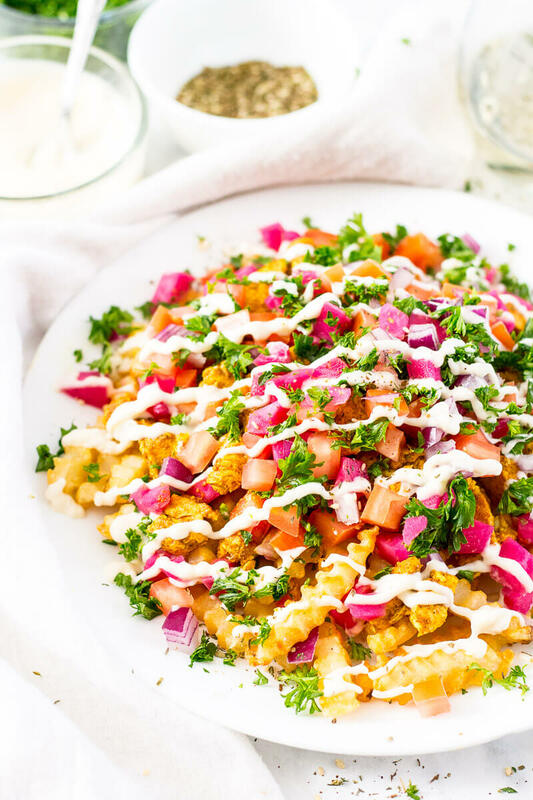 These Loaded Chicken Shawarma Fries are the perfect Friday night dinner. 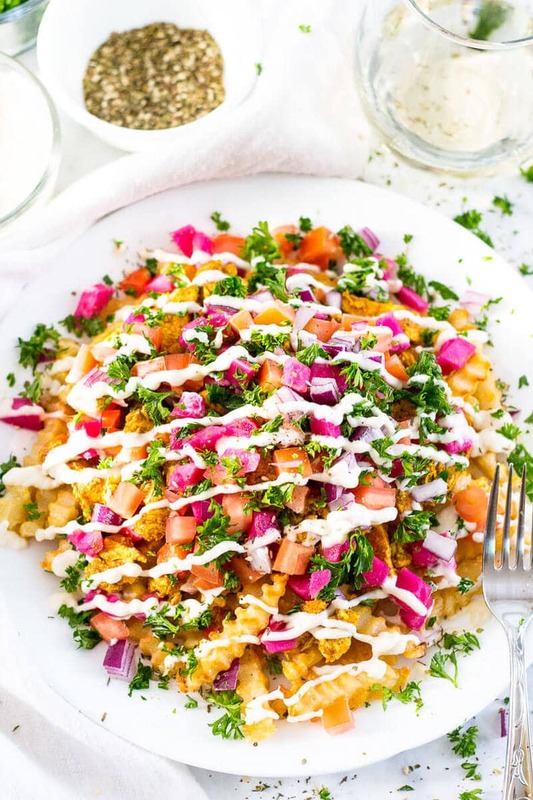 Drizzled with a copy cat toum (aka Lebanese garlic sauce) and topped with pickled turnips, you won't have to head to your neighbourhood restaurant for a taste of shawarma! 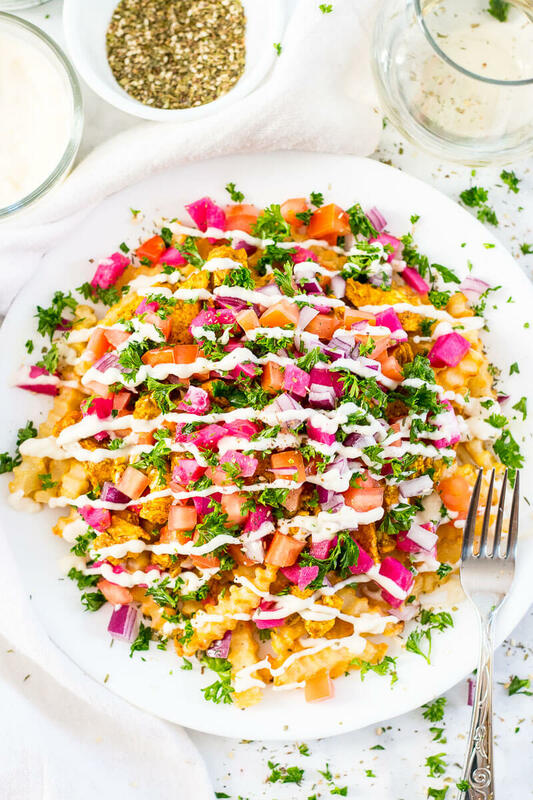 These Loaded Chicken Shawarma Fries are going to be the death of me. Seriously. You know when you make something and it just turns into one of your favourite new meals, and then it becomes pretty much the only thing you eat for a little while? My family and I have a little joke running about my cooking abilities and my dad's ability to enjoy some of my homemade meals. We often end up eating some of the food I shoot for the blog for dinner a few times a week (duh!!! ), so we end up eating a lot of what he would consider “exotic”, trendy things like Chipotle Chicken Burrito Bowls, Thai Red Coconut Curry Noodle Bowls and Butternut Squash Gnocchi. Did I mention we eat out of bowls a lot? And then we all laugh because we know what he's really thinking, and he's just too nice to say it. Well, I mean, he's not the one cooking, right? 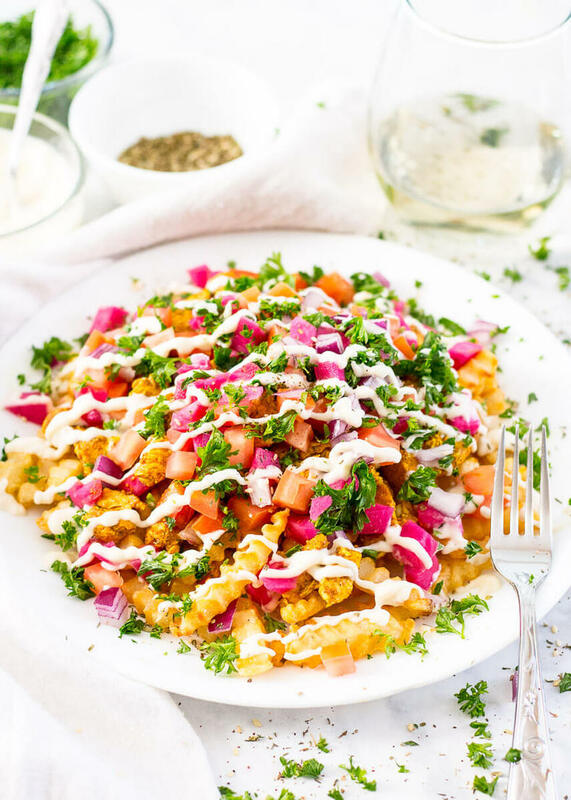 Though they aren't exactly Terry-approved, these Loaded Chicken Shawarma Fries are my go-to when I'm craving takeout. And I should add that my mom and brother love them. That should count for something. I should warn you that the toum recipe I've given here (aka the most delicious sauce on the planet, Lebanese garlic sauce) is totally a lazy white people version. There's mayo in it, it's not at all authentic. But it sure is good, and it's far easier than trying to emulsify vegetable oil into the frothy, creamy deliciousness that toum is, at least when you've been working all day and you're just too tired to do anything. 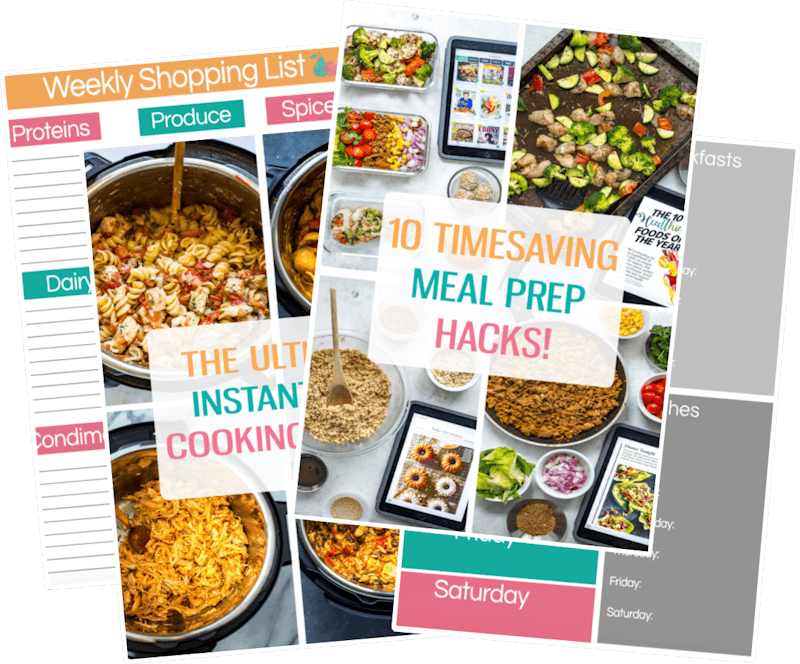 However, if you are looking for a weekend project and have some spare time, I highly recommend that you try to whip some up – Tori Avery‘s got a great guide if you're unsure of where to start. I honestly just let the professionals do it though and cheat by stopping by my local shawarma shop hehe. Well, we've come to the end of the recipe my dear friends! 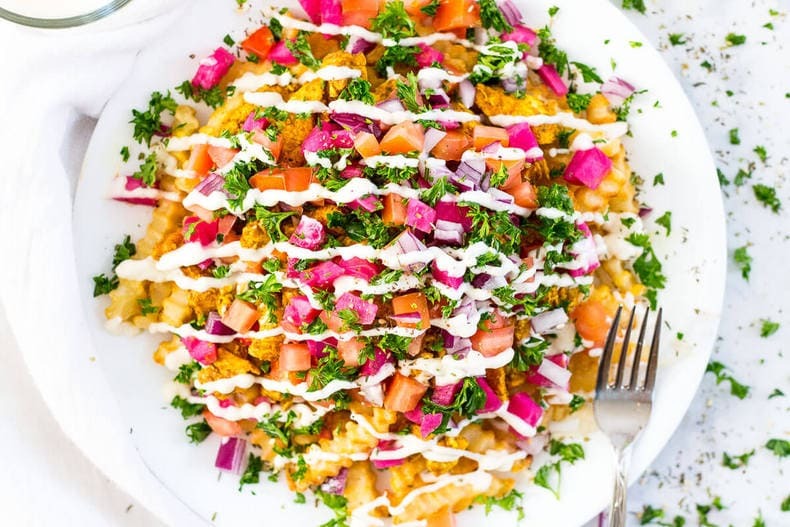 Be sure to watch the video above if you're looking for step-by-step instructions on how to make these – if you love shawarma, these are a must!!! 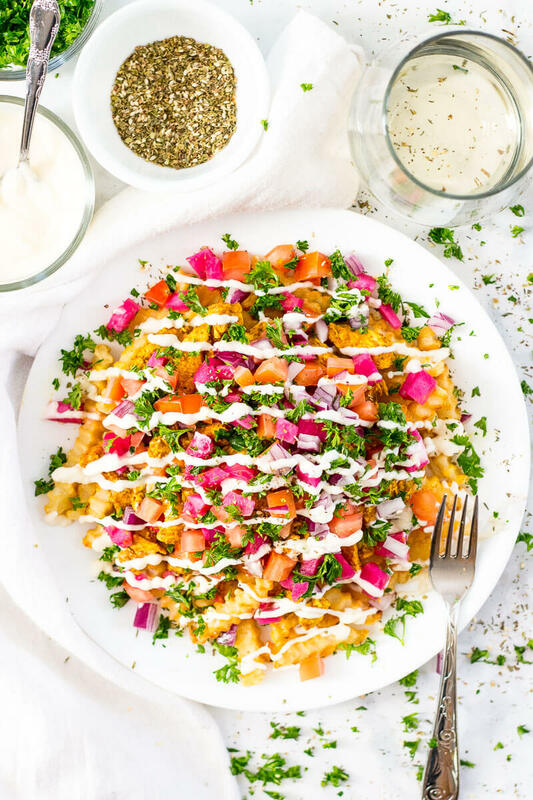 But seriously, let me know if you end up making these Loaded Chicken Shawarma Fries! If you try any of my recipes be sure to let me know on Instagram, Twitter, Facebook or in the comments – I'd love to see what you come up with! In a small, glass, oven-safe dish toss chicken with all shawarma ingredients. Let marinate for 10-15 min then bake in oven for 18-20 min. If you're in a rush and want to cook the chicken while the fries are baking, skip the oven step and cook them in a large frying pan over med-high heat for 10-15 min until cooked through. 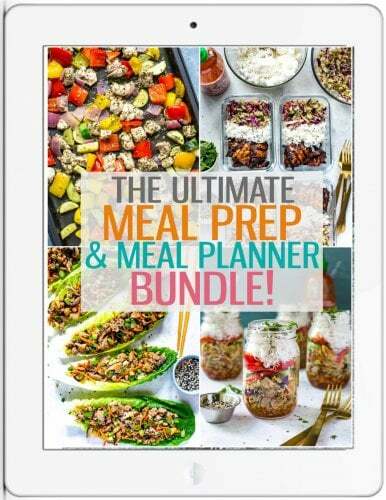 I find the chicken isn't as juicy or tasty this way but it will save you 20 min! Remove chicken from oven (if applicable) and preheat oven to 450 F. Bake crinkle cut fries on a parchment lined baking sheet for 10 min per side. In the meantime, prepare veggies and garlic sauce. Mix mayo, lemon juice and garlic together in a medium-sized bowl. If you want extra creamy garlic sauce, be sure to puree in a personal blender or Magic bullet. 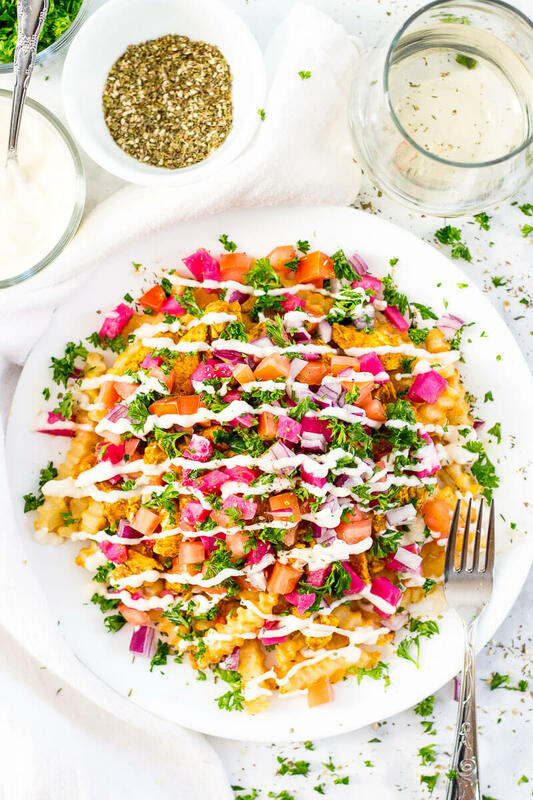 Remove fries from oven and top with chicken, turnips, tomatoes, red onion, parsley and drizzle with garlic sauce. Enjoy! « You Can Now Eat Fresh AND Local at SUBWAY® Restaurants! 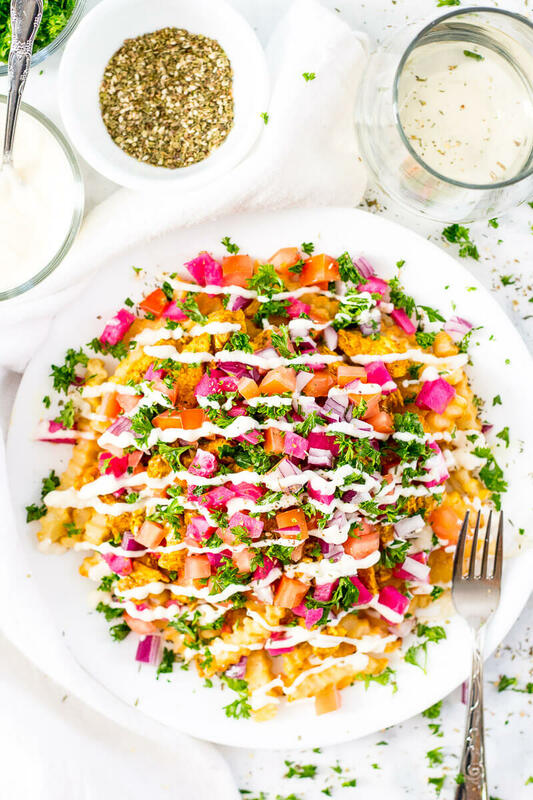 I’m just going to call these Middle Eastern nachos! Love it! That would be such a great name for them! haha thanks Beth!! Oh My!! Shawarma never looked so GOOD!! Perfection! Oh man, these would be the death of me too!! So good. And I just love your photos!! Oh mannnn I made these tonight for dinner and they are thebomb.com! (Sweet dated reference woohoo.) The garlic sauce is to die for, I’m pretty sure I coated my fries in them wayyy too much. Anyway, great recipe Taylor! Wow these look AMAZING! I can tell these will be the death of me too haha can’t wait to try them! This just makes me happy! Fries are my go to, but these flavors just amp them up! I do that all the time with meals! A few months ago, it was chips. Then steamed broccoli with lashing of hot sauce…. Recently, it’s rice cakes (?! Even I don’t get me sometimes).